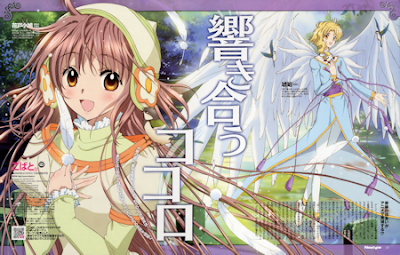 Kobato is the new anime based on the original manga from CLAMP (the same authors of Card Captor Sakura, Chobits, X/1999, Tsubasa Chronicles, XXXholic, and other great stuff). If I'm not wrong the studio that is making the anime is madhouse, the same where Card Captor Sakura was made, so I was expecting something with really good quality. I didn't know anything about the story, but I was really curious to see what was about (because it's from CLAMP and I love their work) and I instantly fell in love with the first episode. Kobato (the anime) is such an inocent and really heartwarming anime. I really like how innocent but not childish is the main character and the story itself. The story begins with a girl that came from the sky (I think?) that go to the human world to fulfill her dream, and to do that, she has to heal scarred hearts and then collected them on a little bottle. Where did she came from? We don't know (but not from the human world). What is her wish? She want's to go somewhere (but we don't know yet where or why she wishes and makes all this effort to do that). So with the innocent and heartwarming feel that we get from the story, we have mistery, and hopefully love and tragedy(?) (It's a CLAMP's work, so I have high expectations for it). Kobato in the left and Kohaku from Wish in the right. are brightly printed in my heart. the light that overflows from my heart reaches the skies. Please guide me, oh distant voice. it's the sound of the resonating wind. I will accept it and keep moving.